Everyone expected the fishing to get good soon and it kinda started yesterday and the bite was much improved today. There were lots of sailfish and mahi mahi caught, lots of marlin seen and even some yellowfin tuna came in range. My buddies went out 25 miles in our boat and caught 3 sailfish, 4 mahi mahi and missed a 300 pound marlin. The guys on the 38′ custom got into a big batch of yellowfin and caught a bunch of 20 pounders on topwater poppers. The guys on the 32′ Irwin Forbes found a cargo net and caught more than a dozen nice mahi mahi…away from the net they releases a half dozen sailfish. 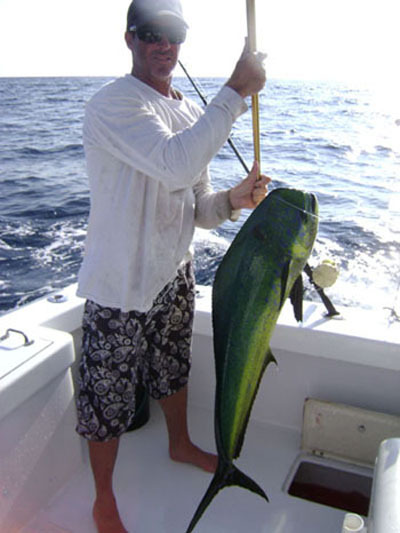 The guys on the 32′ Albermarle hooked also caught good numbers of sails and mahi mahi but the best fish was the 150 ish pound tuna that they hooked and fought for a while before it broke off. The past couple days the fishing has remained unchanged. The boats are working hard and grinding out 2 to 5 sailfish per day, 2 to 5 mahi mahi per day, a marlin here and there and even some yellowfin tuna showed up. I did talk to a couple guys that found the pods and one gu released 11 sails and another released 9…they were less than 35 miles out. The 36′ Gamefisher in Quepos caught 8 sails, 6 mahi and a marlin over the past 2 days. The 32′ Irwin Forbes broke off a 400 plus pound marlin not far offshore…he ended the day with 4 sails and 2 mahi mahi. The 36′ Topaz also caught 4 sails and 2 mahi mahi and the next day caught 2 sails and 3 mahi mahi. The 28′ Center Console did some back to back 1/2 day trips in the bay and ended up with 4 nice mahi mahi in the 40 pound range…they were only 10 miles out. The sailfish bite the past couple days has been hit or miss with everyone still catching some fish. There was a hot bite down near the pocket for about 24 hours and a couple guys I talked to released 8 to 10 sailfish. The bite there was hot this morning but seemed to have cooled off by noon. The 32′ Irwin Forbes release 7 sailfish down by the pocket. The 28′ Center Console raised 5 sails at the corner and released 2. The 35′ Custom in Quepos released 4 sailfish and kept a mahi mahi for the grill. The bite the past few days has remained the same…not great but everyone seems to be catching some fish. The boats in Los Suenos, Quepos, Golfito and Tamarindo all report about the same thing….2 to 5 sails per day, 2 to 5 mahi mahi per day and a marlin sighting here and there. 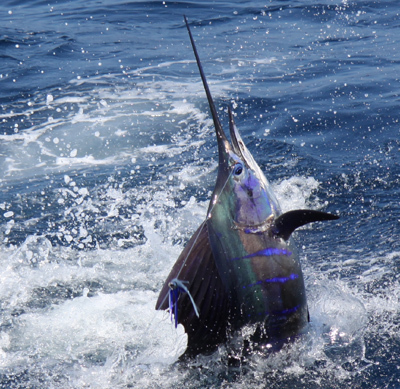 The guys on the 26′ in Quepos hooked 3 blue marlin last week on live bait but didn’t get any of them to the boat. One of the private captains I talked to fishing in the Carillo area caught a stripe marlin, 6 sailfish and a handful of mahi mahi…he admitted they were in the right and place at the right time and did better than most. The pics above are from this past week. The sailfish bite the past couple days has been a bit slow with most guys I talked to averaging 2 to 4 sailfish a day. They are still catching a a handful of mahi mahi in the 40 pound range but the billfish bite has been scattered. The sailfish bite was really good the first couple days of the tourney so they are still out there…maybe just a little out of range. I write the fishing column for Costa Rica’s English language newspaper called the Tico Times and I am in contact with guys up and down the Pacific coast and everyone reports a similar bite. 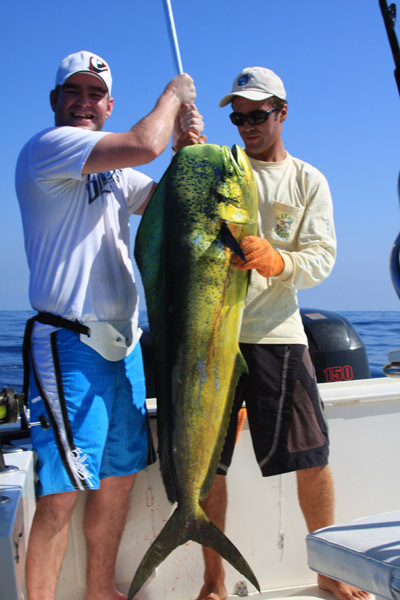 The guys down in Golfito area, the guys up in Guanacaste have all been catching good numbers of mahi mahi, 3 or 4 sails and the occasional marlin offshore. Things were pretty quiet around the marina the day after the tourney ended. There were a handful of charter boats and a few private boats going offshore and everyone doing full day trips seemed to be averaging 2 or 3 sailfish and 4 or 5 mahi mahi. The boats doing half day trips had mixed luck..one guy caught 2 sailfish and 2 mahi and the next day didn’t catch anything. My friends took our boat south about 20 miles for a 3/4 day trip and caught a half dozen mahi mahi …all 35 to 45 pounds. They also had a wahoo bite and a couple sailfish bites. The water is calm and the weather has been hot and sunny. The final day of the Los Suenos Signature Billfish Series is off to a slow start for most of the boats. At the 10.00 am update there had only been 35 sailfish caught. One of the 42′ Mavericks has 6 sailfish already today and they have gone from 6th place to second place. If the sailfish bite slows today anyone in the top 10 that catches a marlin has a chance to take the big prize. It should be an interesting day out there…I will provide updates every couple hours. The noon update for the final day of the tourney continues to show a slower than usual bite offshore. 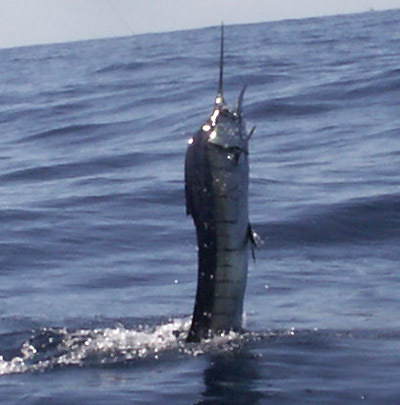 There were 65 sailfish and 2 marlin caught by noon today. The boats that caught marlin were in the middle of the pack so the leader board remains unchanged. 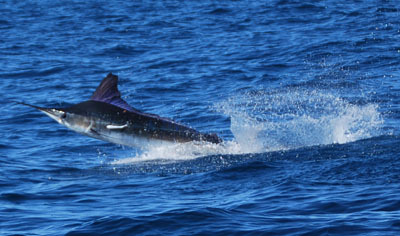 The 2 pm update is in and they are up to 100 sails and 2 marlin so far today. The Cerveza remains in first place by 500 points over the second place Big Oh. The Big Oh is top boat today with 10 sailfish. There are 4 or 5 boats challenging for third place and they are all within 100 points of each other. The last 2 hours of the tourney should be good. One of those top teams is going to have to find a pod of sailfish and/or catch a marlin or two to overtake the Cerveza. The results are in and congrats to the Carveza for taking 1st place in the first leg of the Los Suenos Signature Billfish tourney. The Big Oh was 2nd and the Hook was 3rd. There was no late afternoon sailfish bite and only 1 marlin caught between 2pm and 4pm today so the leaderboard remained unchanged. In the 3 day tournament there were 676 sailfish and 12 marlin caught by the 42 boats in the tournament. The sailfish bite on second day of the Los Suenos Signature Billfish Series was still hot but the marlin have been hard to find this week. The Cerveza moved into first place with a total of 25 sailfish and 1 marlin, The Hook is in second place with a total of 25 sailfish and the Lady Columbo and Outer Limit are tied for 3rd place with a total of18 sailfish and 1 marlin each. The top boat today was the Outer Limit with 13 sailfish and 1 marlin on day 2. There was 232 sailfish caught today and only 2 marlin. The top 12 is pretty bunched up with the top team at 3000 points and the #12 team at 1700 points…so anything can happen tomorrow on the final day. If any of these boats can get a marlin or two tomorrow they will be in the money. The bite seems to have turned on just in time for the first leg of the Los Suenos Signature Billfish Series. This past week has been windy so there was a lot of water that was not being pre fished for the tourney. The sailfish bite was hot if you were in the right spot…several boats had more than 25 sailfish bites. My buddies on the 42′ Maverick are tied with The Cerveza for the lead with 13 sailfish and 1 marlin. 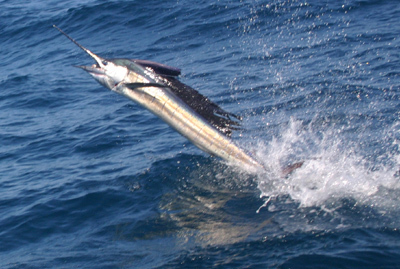 The Lady Columbo and the Hook are tied for 3rd…Lady Columbo has 12 sails and a marlin and the Hook has 17 sailfish. There are 4 of the 42′ Mavericks in the top 10…those boats raise fish. There are 42 boats in the tourney and on day one they caught a total of 284 sailfish and 7 marlin. Those marlin are going to be the golden ticket again this year. The first leg of the Los Suenos Signature Billfish series starts today and there are some 40 boats entered. The winds have calmed down and the boats should be all spread out trying to find the hot bite. Most captains are keeping hush hush on what they have been doing the past few days but the guys I talked to yesterday did pretty good. One boat went 8 for 10 and sailfish and another boat went 10 for 13 on sailfish. I heard there were no marlin caught yesterday by anyone in the fleet…although If I caught a marlin the day before the tournament I wouldn’t tell anyone either. When the fishing is like this anything can happen in a tournament. With marlin being worth 500 points and sailfish worth 100 points the guys that are able to find the marlin will finish in the money, especially if only a few are caught each day. There are 2 parts to the tournament one in January and one in February. Last years the top 3 teams were the Clean Sweep, Let it Ride and the Game on. I would imagine those are the favored boats again this year. I’ll be out at the marina today and updating the day 1 results as they come in. 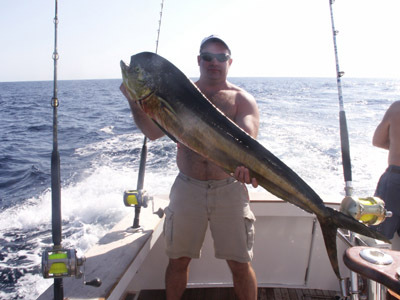 You are currently browsing the Costa Rica Fishing Reports blog archives for January, 2010.